Squishies! They’re squishy, they’re irresistible, they’re adorable! For these reasons and more, my squishy valentine cards will be a HUGE hit with your child and all the children in your child’s class this year. Happy soon-to-be Valentine’s Day! Do you love it or loathe it? I don’t mind Valentine’s Day, but it IS kind of just another thing that makes me even busier than I already am. That’s why I LOVE LOVE LOVE printable Valentine cards for kids. I don’t have to remember to pick up some Valentines at the store. I can just print them out from home. How easy is that? And I ordered the Squishies from Amazon, too. So there you go, no need to make a special trip to get Valentines for your kid’s class. 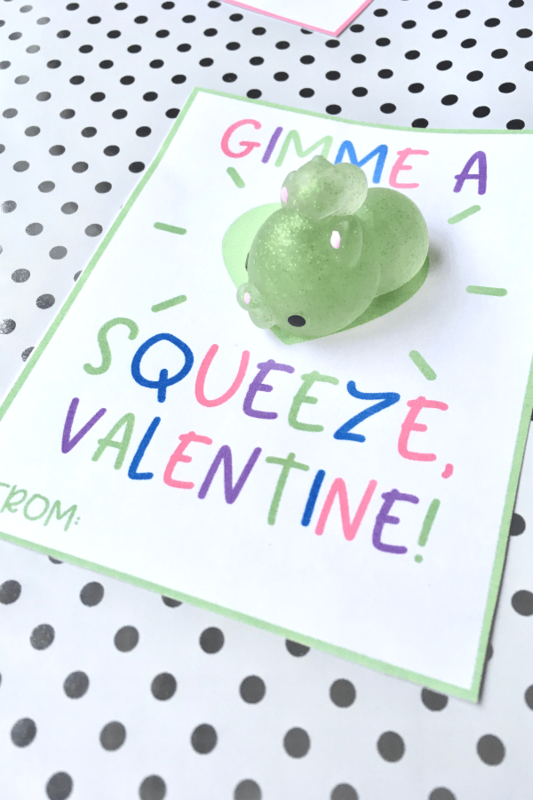 I was inspired to make these Squishy Valentines because well, there’s kind of a Squishies craze going on right now. My kids love them. Even my middle school students love them. 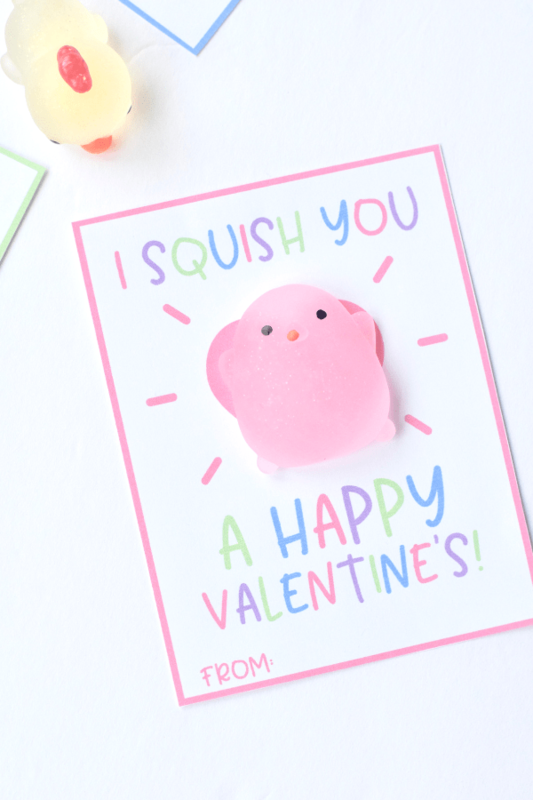 I compiled a list of Trendy Printable Valentine Cards for Kids and I knew that the list wouldn’t be complete without some Valentine Squishies. I also wanted something that was inexpensive and candy-free. So wait. What are Squishies? Squishies are like updated, adorable little stress release balls. They are made out of super soft foam and are designed to be squeezed. You may hear them being called “kawaii squishies” (kawaii is the Japanese word for cute). They come in all different shapes and sizes, and commonly feature animals or food. The glitter Squishies that I received are SO cute. There was a huge variety. I can’t even choose the cutest. What do you think? The penguin? Sun? Koala? Squirrel? 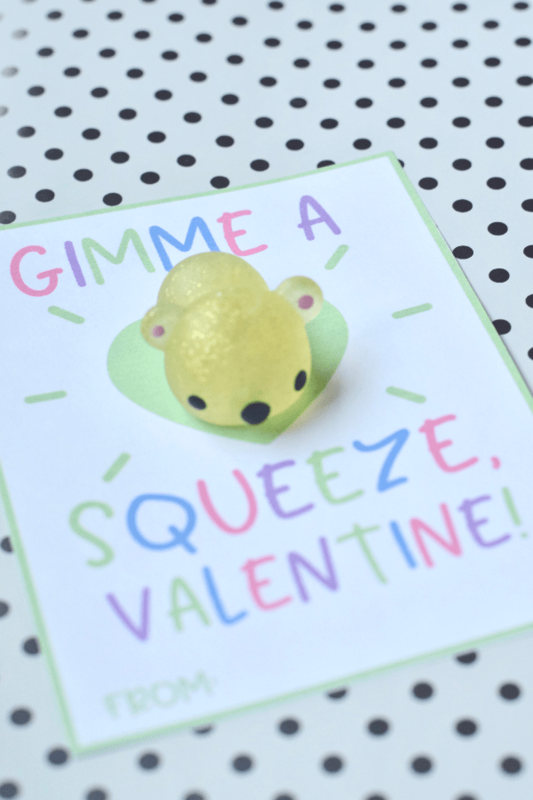 So you’ve decided to use my Squishy Valentine cards for your kid’s Valentines this year? Great! Click below to gain instant access to your Valentines. 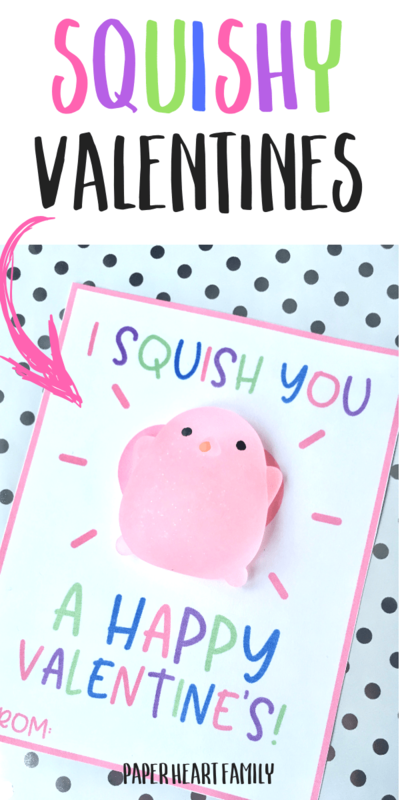 Purchase Squishies- I used the glitter Squishies, but there are MANY different varieties to choose from that you can check out here. Cut out your Valentine cards using scissors or a paper cutter. Adhere your Squishies to the card with a glue dot. There you have it! Super fun, super cute and super easy. Click HERE to print instantly! Still unsure? Check out my Emoji Valentine Cards and my Valentine lunch box notes. 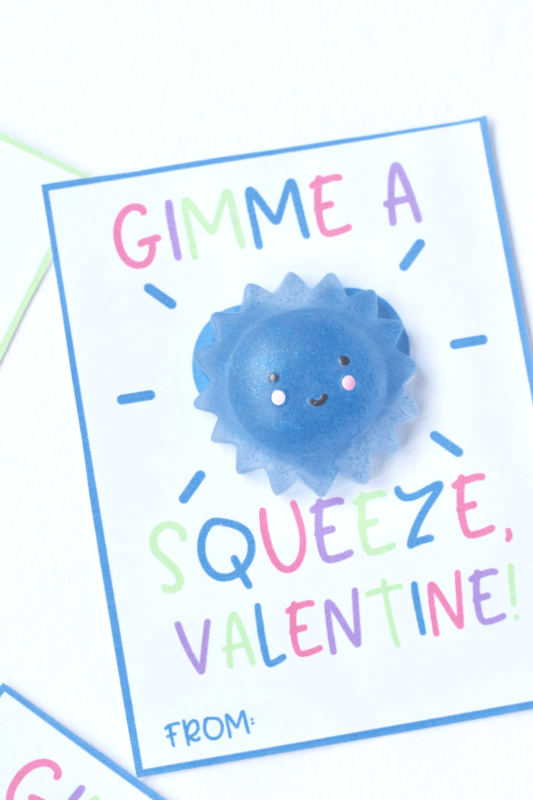 Your child will LOVE giving out these Squishy Valentine Cards this year. These are adorable! Thank you for such a CUTE and TRENDY idea! The kids are going to love these! I just ordered our glitter squishes once I received my email with the printable link. Thank you again for getting me some “cool mom” points. Thank you so much! Your comment is making me blush! I hope you truly love them 🙂 I’m sure they will be a hit, my daughter can’t wait to give hers out! These are adorable and my daughter cannot wait to make them for her classmates! Thank you for sharing your creativity! Thank you so much Susan! I’m sure your daughter will have SO much fun picking the perfect squishies for each of her classmates! Thank you SO much for the positive feedback! I kinda love them too! Super cute idea, thank you so much!! I know the kids will love them! Thanks, Veronica!! I’m sure they will too! Thank you so much for making my mom “job” a little easier this Valentines Day!! We just received our squishes tonight from Amazon and you are absolutely right, they are all adorable! !l We can’t wait to start putting them together! EEEEEK! That’s what I’m here for! I love helping other mamas out 🙂 I bet your child will have so much fun going through all the Squishies and picking the perfect one for each of their classmates. My daughter loved that part. No problem, Julie! I’m so glad you and your daughter love it! Best ever?! Cassandra, I’m blushing!! But seriously, I know what you mean. Both of my kids had a tough time letting go of their Squishies. Especially my 3 year old. She of course wanted to keep all of them!